It is very interesting to watch something actually grow. When I watch my orchids, for example, one of them will have blossoms that are fading away and dying while new blossoms are just opening up. Just so it is with us. We hit a dead end in one area of our life, only to have another open up unexpectedly. The universe abhors a void. If you read the self help books, everything supposedly proceeds in steps. For example, I am a Schwarzbein practitioner and have studied with Dr. Diana Schwarzbein, M.D., about how to heal the metabolism and balance hormones naturally. The Schwarzbein process has five steps. I have been tested on this process extensively. I am supposed to know it backwards and forwards. But I work with what I refer to as actual humans – as opposed to the ones in textbooks, who follow all rules like donkeys following a narrow path on the edge of a cliff. Actual humans, actual plants like orchids and actual living beings do not follow linear processes, even if they are very left-brain dominant and want everything to add up, be proven by lab tests and follow a plan they have read about extensively on the internet. Actual humans go something like this. They go through a period of chaos that forces them to change. They face the music, make the few changes that they have energy for, and then they take a period of time to process and assimilate. It takes chi to make a change. Therefore, if your chi is depleted, the number or degree of changes you will be able to make may be somewhat limited. This is not to say that you can’t think about it, or can’t put yourself in an environment that is much more likely to foster your own personal growth. I am always saying that environment is the most powerful factor. If you hang out with mentally/emotionally/physically unhealthy people in a mentally/emotionally/physically destructive job or home situation, that is eventually going to take its toll, and it won’t be just physical, it will take its toll on literally every level being affected. Even if you are totally depleted, you can start to foster the process of change by placing yourself in an environment where you are more likely to get fresh air and sunlight, metaphorically and metaphysically speaking. That means you can surround yourself with rocket booster people who are themselves mentally/emotionally/physically and hopefully spiritually healthy and hope that somehow their attitudes will rub off on you, almost by osmosis. Even if you are dead set against change, if you put yourself in this healthy environment, any kind of miracle could happen. For example, one of my new yoga students went to the doctor and discovered, to her delight, that her blood pressure had normalized. She comes to my Monday morning 11 a.m. easy yoga class, and often has not even been able to attend. She liked the class so much she invited her friend. She came back the following week – only her second yoga class ever – and looked like an entirely new person. Something special had rubbed off. She was happier. 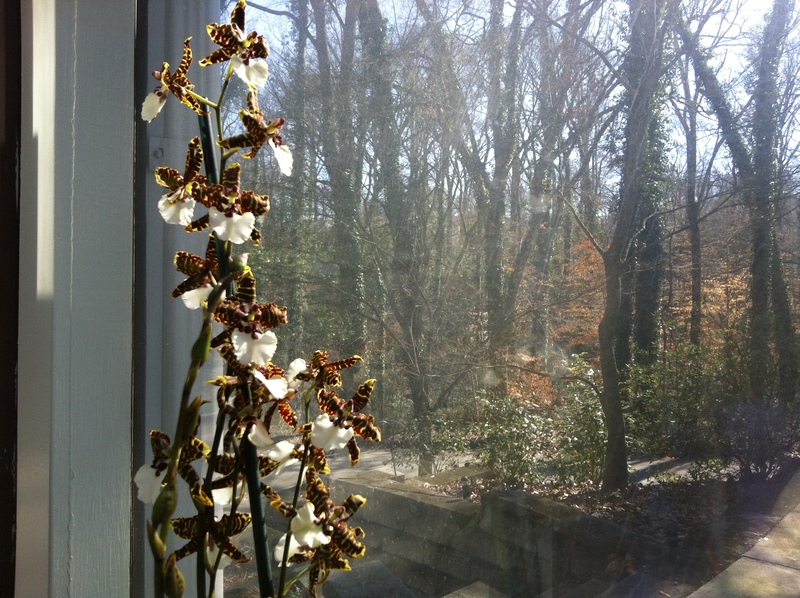 I just got this oncidium orchid this afternoon at the Atlanta Botanical Garden, my favorite place to buy orchids. I admit it is very difficult for me to make a decision about which orchid to bring home, as usually I want all of them. But sometimes one just speaks to me and I have to have it. I haven’t had any oncidiums for awhile. This one replaces a yellow phalaenopsis that I had nurtured to a second round of blooms. It was really going crazy, having new shoots and new buds and I was getting very excited about it. Then I noticed a small covering of mealy bugs. I had emailed my friend Don Dennis of www.healingorchids.com some time ago to ask his advice about mealy bugs. Mealy bugs are apparently like flames. It hurts my heart. I had to separate the yellow orchid and bring it upstairs to my breakfast table. The mealy bugs are flourishing, just as the buds and the new shoots are also making their way. I fear that the mealy bugs are actually winning. It is painful for me to watch. Meanwhile, I have cleared the space in my studio and am bravely starting out with my new oncidium. I have to bless the mealy bugs, because if they had not attacked, I would not now be having this new adventure with my oncidium. Once, a few years ago when we were having a terrible drought in Atlanta, I felt terribly pained with the trees and the shrubs that were passing away. A friend of mine reminded me that every living being has a choice. I had to bless the passing of the trees and shrubs. I had to watch for what was coming along next.